Heisenberg’s Uncertainty Principle from wave-particle duality. The wave-particle duality states that any mechanical object can exhibit both wave and particle behavior and the complementarity priniciple states that they can not both be observed simultaneously. That is the wave and teh particle nature are only exclusive ly observed given a specific time or time window, the window being consistent with Heisenberg’s uncertainty prinicples of which there are more than 3 forms. But only 3 forms of these exhibit a simple relation from which other-variable relationships can be derived much in the same way kinetic energy is derived from mass and speed of a particle. The intention of writing this blog for me is to show how a basic reasoning can be applied qualitatively to obtain a semi-quantitative or intuitive relation between variables to extend an inequality relation between these variables. I will show here only for energy and time uncertainty relationship. From the wave particle duality it is clear that any entity/object/process has a particle or wave character both in the same system but not in the parametric sense of same time. Once time is chosen/defined as a specific kinematic parameter wrt that time the wave and particle nature are not simultaneously observed. So let us consider a particle, say a neutrino or an electron. This particle has a well specified physical location in space. This is the mean position therefore of the particle. This mean has a zero distribution for a classical particle but for a quantum mechanical particle or system the distribution is not zero. Now the particle also being a wave it has a characteristic of wavelength. This wavelength therefore gives the extent of deviation of the particle’s position from its mean location. The wavelength is lambda. 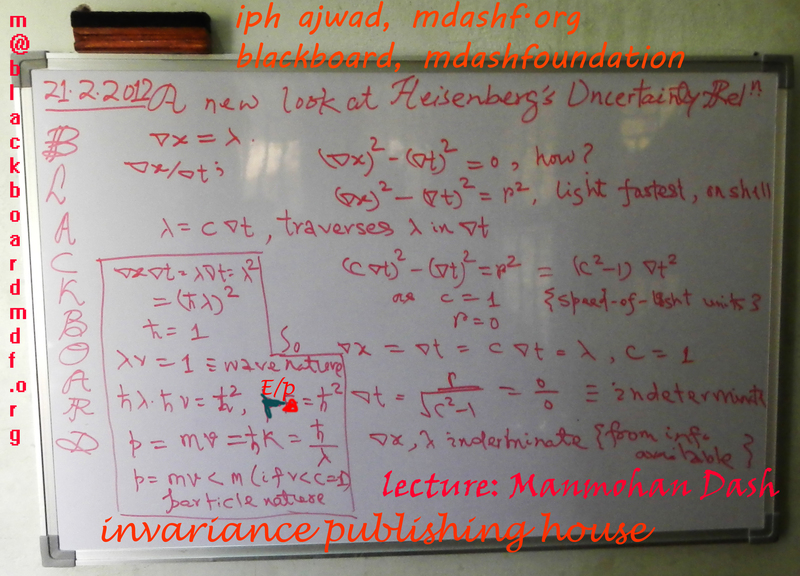 ‹ Feigenbaum constant and Compton Wavelength factor !